My husband, the pruner in chief. It used to be that I had a crush on a crooner ( old blue eyes of course ) and now I have a crush on my husband the head pruner. Oh, how he loves to prune. Since he's been working full-time in a renowned vineyard he has imbibed the art of pruning. He makes fast yet accurate decisions regarding any and all vines which is jolly important as it is one of the main secrets of a great wine. These last few years we've acquired the genteel habit of vegetable gardening. Tomatoes,beans, potatoes, chillies and a jungle of zucchinis have been our main produce and even if I say so myself, they've turned out well if not often prolific. For former townies that is a fantastic achievement. Bob settled a bunch of tomato plants into one side of our kitchen garden and even went the extra mile to put up metal poles and strung string around them so that the growing plants had a place of reference. In fact, it looks nice and abundant as they have grown to their heart's content. 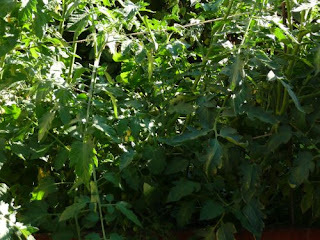 Well, that might be the problem as only a handful of tiny tomatoes are dangling among this jungle. Bob has started pruning the tomatoes and at first I had to giggle thinking of it but now it makes sense. Just like grapes, tomatoes need enough nourishment from their branch which naturally isn't the case if too many little branches veer off the main one. Yes, this afternoon we've started to prune and I wish I could describe to you the divine scent that came off the stalks as they were chipped off. Tomato plants have a sweet and tangy scent all of their own and if the scent is anything to go by, then the tomatoes should be out of this world. 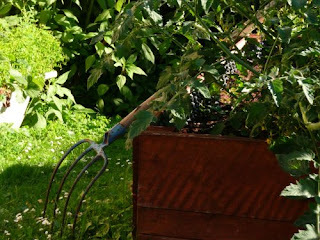 A pitchfork taking a breather next to the edge of our kitchen garden...tomatoes are making themselves prominent. Bob still has to get stuck in there.